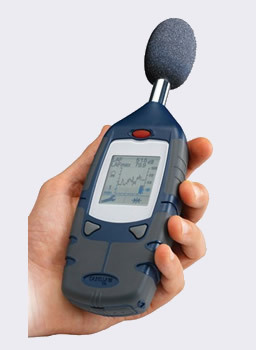 This "general purpose" sound level meter is ideal for making manual noise measurements, noting down the results by hand. 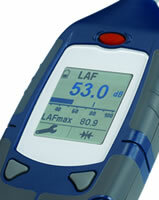 It measures both "A" and "C" weighted sound level with either Fast or Slow time weighting. This meter is calibrated to ANSI S1.4 Type 2, as is the Sound Level Calibrator that is included in the kit. Calibration certificates are included for your records. For any applications that may have impulsive or loud banging noise we recommend you use a sound level meter with Peak measurements, such as the CEL620B2. Press the red button to switch the meter on. It starts measuring right away. The meter is powered by standard AA batteries (included in the rental kit). Some regulations demand the function of the meter is checked first. Place the Calibrator over the mic and select Calibrate from the menu. Start the measurement and read the sound level from the display. A reset button is used to clear the maximum sound level.